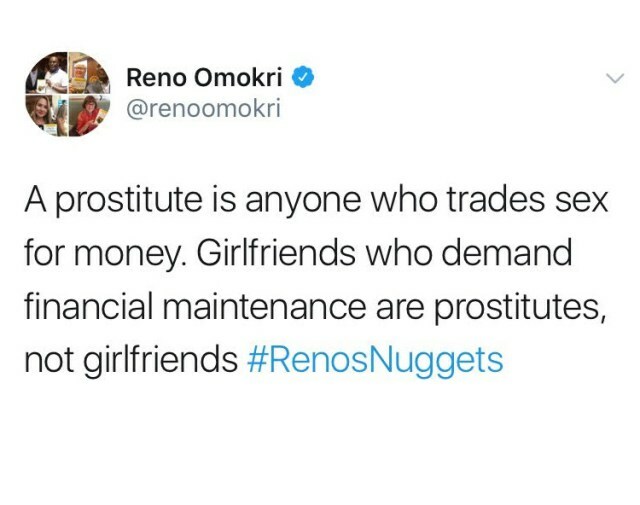 Reno Omokri, in his usual way has dished out his Nudgets on twitter, and this time, he says “If your girlfriend demands for financial assistance from you, issa prostitute. Meanwhile, Reno few months back slammed the founder of the Adoration Ministry, Fr. Ejike Mbaka for defending President Buhari. Omokri in a Tweet, accused Mbaka of doing nothing when the wife of a pastor was killed in Abuja. He said “Fr. Mbaka, the wife of a pastor was beheaded-you kept quiet. Suspects were set free-you kept quiet. Today you find the voice to defend PMB! Twitter Nigeria Thinks P-Square’s Wives And Elder Brother, Jude Are To Be Blamed For Their Split.